Power Generation Industry Booklet This is a 4 page, single fold document that details our commitment to servicing the Power Generation industry. For a high-resolution version of this booklet to have translated and/or printed please email art@hytorc.com and Betsy at Btapp@hytorc.com. Mitsubishi Certificate of Qualification Hytorc is now an approved registered supplier to Mitsubishi Heavy Industries. Korea Hydro & Nuclear Power Co. Ltd. Certificate of Registration HYTORC is an approved, registered supplier to Korea Hydro & Nuclear Company. Industries cut sheet 2-sided cut sheet that features just a few of the industries catered by HYTORC. Email and printable formats of the Industries cut sheet. Printable format has crop marks and bleed. HYTORC Company Catalog The official company catalog of HYTORC which features the complete line of HYTORC products and services. For a high-resolution version of this catalog to have translated and/or printed, or if you need a smaller version for email, please email art@hytorc.com and Betsy at Btapp@hytorc.com. The HYTORC Standard "As a leader in the industry, HYTORC stands apart from its followers with a simple standard to which we hold ourselves accountable:" Opening with a personal note from Eric, this brochure illustrates briefly but thoroughly our commitment to superior technology, quality and support. 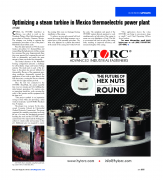 For a high-resolution version of this brochure to have translated and/or printed, please email art@hytorc.com. HYTORC Industries Brochure 2018 - English A brochure focused on the industries serviced by HYTORC as featured on our website. This post is for visual reference only. This item is not kept in stock but is available in digital format and can be made to order. Please email art@hytorc and Betsy Tapp at BTapp@hytorc.com with all inquiries. UPDATE (071918): Minor corrections to grammar and industry title capitalizations. UPDATE (082018): HYTORC Russia phone number corrected (+1 551 264 3467).